MSA | What is MSA (Measurement System Analysis)? HomeQuality Core ToolsMSA | What is MSA (Measurement System Analysis)? 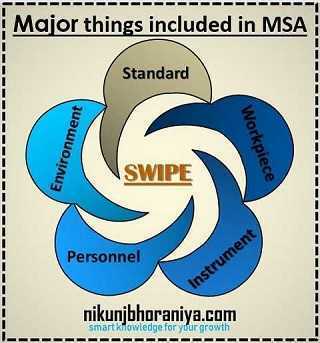 ➤ What is MSA (Measurement System Analysis)? 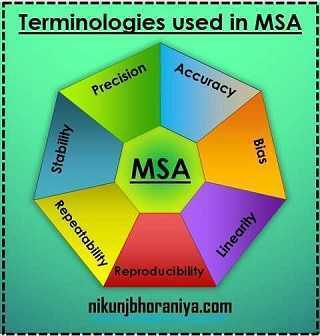 → MSA is a Measurement System Analysis. → It is a statistical tool used to determine if a measurement system is capable or not? → We use various measuring instruments & gauges to judge the dimensional quality of Incoming, In-Process and Finished Production parts. → These gauges and instruments have to be Precise and Accurate to give results of a higher confidence level. → To build this confidence, we have to calibrate these gauges/instruments periodically to achieve Accuracy and Precision. ➤ Below measuring instrument has a definite numerical scale to measure the numerical dimensions of the component. → E.g., Vernier, Micrometer, Dial indicator, Height Gauges…..
→ "Resolution" is the smallest unit of measurement that can be indicated by an instrument. → "Sensitivity" is the smallest amount of difference in a quantity that will change an instrument's reading. → E.g. a measuring tape have a resolution, but not sensitivity. Accuracy and other relevant factors shall be considered. → There are certain terminologies which should be understood for better use of Gauges and Instruments in Measurement System Analysis. 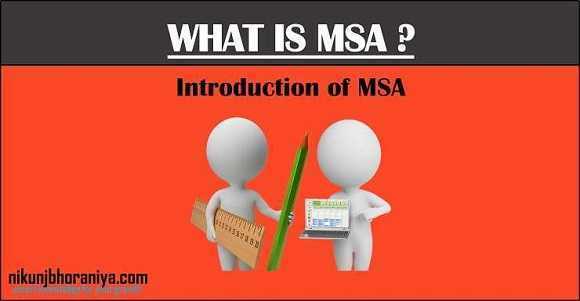 3) Why MSA is required? → MSA is required to understand the impact of these measurement systems on your operations. → It is extremely important in continuous process improvement. → We must measure to know where we are. → For measurements to be effective, they must be timely, accurate, and precise. → Many of our customers, both internal and external, rely on our measurements. → Measurement System Analysis deals with analyzing the effect of the Measurement system on the measured value. → To determine how much error is in the measurement due to the measuring process itself. → Quantifies the variability added by the measurement system. → Applicable to attribute data and variable data. → Conducting an MSA reduces the likelihood of passing a bad part or rejecting a good part. → On the critical inputs and outputs prior to collecting data for analysis. → For any new or modified process in order to ensure the quality of the data. → Engineers who measure and makes decisions about these measurements should be involved in this study. 👉 Note: MSA is an analysis of the Measurement Process, not an analysis of the people !! It comes before SPC.